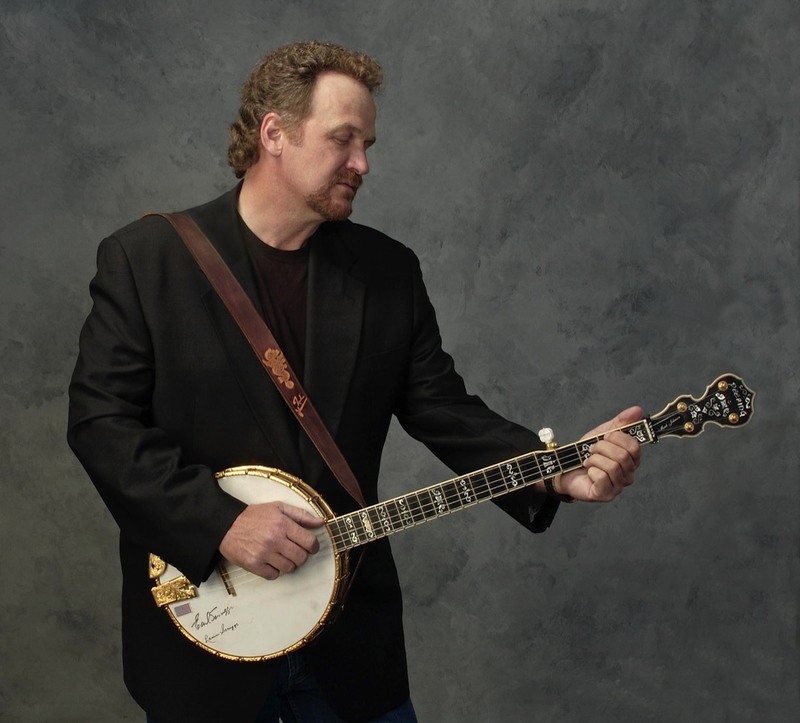 Mark told he’d stumbled upon my teaching site, listened to the sound files, and came to the conclusion that my approach to the banjo was the closest to his own that he'd yet heard. He then hit me with the question that had prompted the phone call in the first place. He asked how I had learned to play and which artists had most influenced my playing. I told him that as strange as it might sound, I hadn't modeled my playing on other clawhammer artists as much as I had guitarists such as Doc Watson and Tony Rice. I suspected that this revelation might shock Mark, but it turns out that he wasn't surprised at all and had been expecting an answer similar to this. Mark subsequently send me a couple of his CDs and it was my turn to be struck by the similarities in our playing. I immediately noticed that Mark used a more controlled approached to "skips" (syncopation) than most clawhammer banjoists. I also noticed he often followed a skip with a “popped” note that is made by rolling the thumb; forcing the string to snap back against the fingerboard. This creates a syncopated effect similar to what an electric bass player achieves when playing “slap” bass. Mark also tends to employ more drop thumbing (roll patterns) than most, especially when he's playing in larger ensembles. This helps avoid cluttering up the mix when playing in genres other than “old time” music, and especially useful when replacing a three finger banjoist in a bluegrass setting. Let's take a look at a YouTube video featuring Marks playing. From a technique standpoint, there’s a lot to like about this clip. I’m a great advocate of economy of motion and Mark’s left hand is a textbook example of this concept. Watch as he moves effortlessly between chord positions which, by the way, is one reason this piece sounds as smooth as it does. I’m also very impressed with Mark’s right hand. 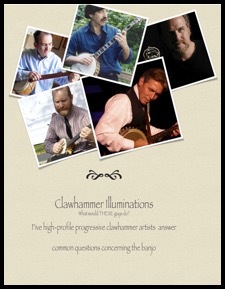 Clawhammer banjo players tend to argue endlessly over thumb technique. Some set their thumb against a string every time a fingernail of the right hand strikes a string, others let their thumb “float” above the strings on each strike of the nail. Mark utilizes both of these techniques in his playing, which is exactly what I like to see in a clawhammer banjoist. Why limit yourself to a single right hand approach when you can take advantage of the benefits of both? Mark’s playing demonstrates his understanding, and mastery, of multiple techniques. Finally, watch how relaxed both of Mark’s hands remain while he plays. I’m a firm believer in avoiding tension at all costs, and judging from this clip of 'Mosby's Rangers', so is Mark! I'd like to conclude with an exclusive! 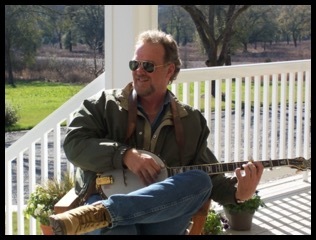 Mark sent me an unreleased recording of an original tune he recorded with three-finger banjo phenom Allison Brown. Mark told me that this "was written for Steve Martin’s Birthday on August 14, 2011 (Sunday) and it is about his Yellow Labrador Retriever named “Wally” who joins Steve and the Steep Canyon Rangers on stage during their shows." If you play banjo and are looking for some advise on how to improve your technique, I suggest you closely watch, listen, and emulate the playing of Mark Johnson. A native of Yorktown Heights, N.Y., Mark now hangs his hat in Florida but learned his trade from Jay Unger while living in New York. 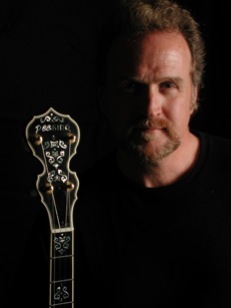 Mark didn't know that Jay was a highly accomplished fiddler who also tinkered with the clawhammer style of banjo. It was in the early 1970s, that Mark learned from this consummate fiddler the basic technique of clawhammer banjo. He also learned the three-finger style of bluegrass picking as his familiarity with the instrument unfolded.